Last week, in Shanghai, Norwegian Cruise Line christened its first purpose-designed cruise ship for the China market, the “Breakaway Plus” class Norwegian Joy, or Xi Yuè Hoo in Chinese. With a Ferrari-branded go-kart racetrack on board, this ship offers a number of new attractions for the Chinese market. Eleswhere, Hurtigruten has announced a half dozen Atlantic Canada and New England cruises for Spring 2018. And, after its successes with music cruises in Australia, Cruiseco continues now with a series of UK music cruises. Norwegian Cruise Line’s first custom-designed cruise ship for the Chinese market, Norwegian Joy (named Xi Yuè Hoo in Chinese) was christened on Tuesday, June 27 in Shanghai. The ceremony featured a performance by the ship’s godfather, singer song writer, music producer, actor, film director and “King of Chinese Pop” Wang Leehom. Measuring 1,094 feet by 136 feet, the 167,725-ton ship was built by Meyer Werft in Papenburg and is the second of Norwegian Cruise Line’s “Breakaway Plus” class vessels. The Norwegian Joy can accommodate 3,883 guests. The new ship’s hull art was designed by Chinese artist Tan Ping and features a majestic phoenix. The official naming ceremony thus began with a performance by dancer and choreographer Yabin Wang, who gave her interpretation of the spirit of the phoenix through dance. Tan Ping also made a special guest appearance at the ceremony. He chose the phoenix as the iconic bird represents beauty and good luck in Chinese culture. Norwegian Joy features a two-deck race track, with enough room to accommodate 10 electric go-karts at one time, the world’s first race track on an ocean-going vessel. The ship has been equipped with an outdoor laser tag arena, water slides, bumper cars and, for shopping, Norwegian’s largest shipboard mall. 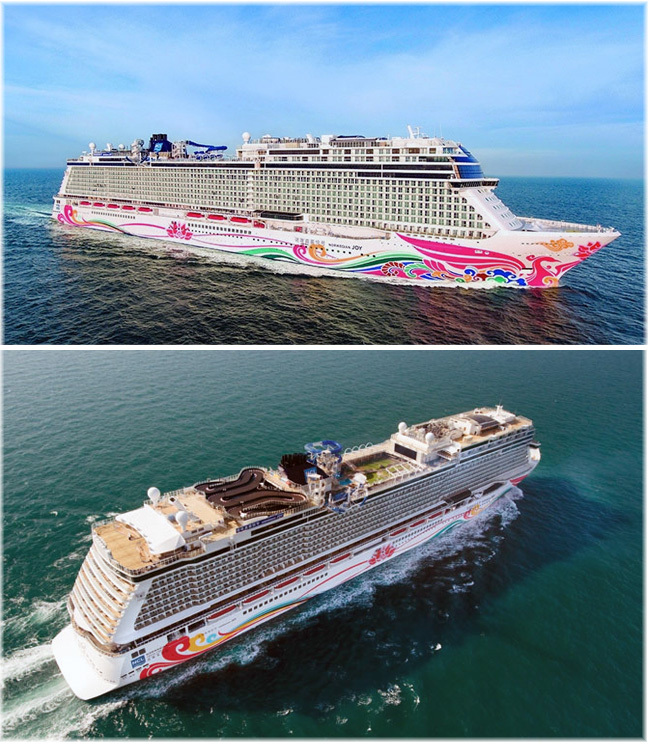 Norwegian Joy’s naming marks the end of a month-long inaugural tour where the ship has been showcased through events at Singapore, Qingdao, Shenzhen and Hong Kong, as well as operating trade cruises from Norwegian Joy’s homeports of Shanghai and Tianjin. As an aside, when TPG Capital and the Canada Pension Plan invested $500 million in Viking Cruises last autumn the line also revealed something about its plans for the China market. Like the big ship lines, Viking has developed a cruise product for Chinese clients. That country now constitiutes the world’s largest outbound tourism market and is growing rapidly. The number of Chinese visiting Europe, for example, is expected to exceed the number of Americans by 2020. Last autumn, Viking announced that one of its 190-berth “Longship” class vessels would be dedicated to the Chinese market, offering 10-night Rhine cruises between Amsterdam and Basel, while a second would start sailing the Danube in 2017. While modest in comparison to the Norwegian Joy, this will still place another 380 berths into the Chinese cruise market. The vessels feature Mandarin as their primary language and are a separate product from the ships marketed to guests from the US, Canada, the UK, Australia and New Zealand, where English is the prime language. The new Chinese-designated ships have signage in Mandarin and the cuisine as well is Chinese, with regional chefs. Eight Mandarin-speaking guides have been assigned to look after twenty-five Chinese passengers each. These ships also pick up some of the slack in a market that is affected by fewer Americans travelling to Europe. 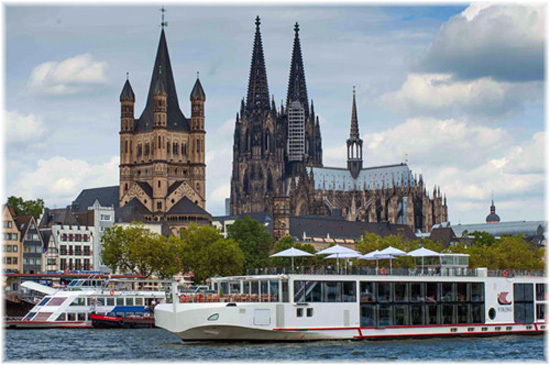 Viking’s European river cruises presently carry 88% North Americans, 10% Britons and 2% Australians. Meanwhile, word this spring was that the Chinese ban on tourism to South Korea has put a damper on the full-ship charter business that cruise lines depend upon in the China market, where it works with groups such as Alibaba. In February, before the impact of the Korea travel ban, Norwegian indicated that they were planning a second dedicated ship for the China market. 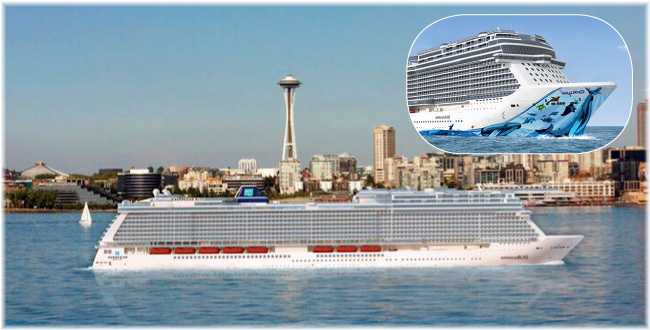 In addition, it is reported that some of the new attractions on Norwegian Joy may be adopted on near sister ship Norwegian Bliss, planned for the Alaska market. Royal Caribbean, Costa Cruises, Princess Cruise and MSC Cruises have all dedicated ships to the Chinese market in recent years and Carnival Corp & plc has also ordered ships to be built in China for a new Chinese joint venture cruise brand. Hurtigruten, who have been running the legendary Norwegian coastal voyage since 1893, will add Atlantic Canada, Newfoundland, the Gulf of St Lawrence and New England to its itineraries starting in April 2018. Following the 2017-18 winter season in Antarctica, the 318-berth Fram will depart Miami in early April and sail up the East Coast to offer April and May sailings between New York and Halifax. Key ports include New York, Boston, Newport, St John’s NF and Halifax. 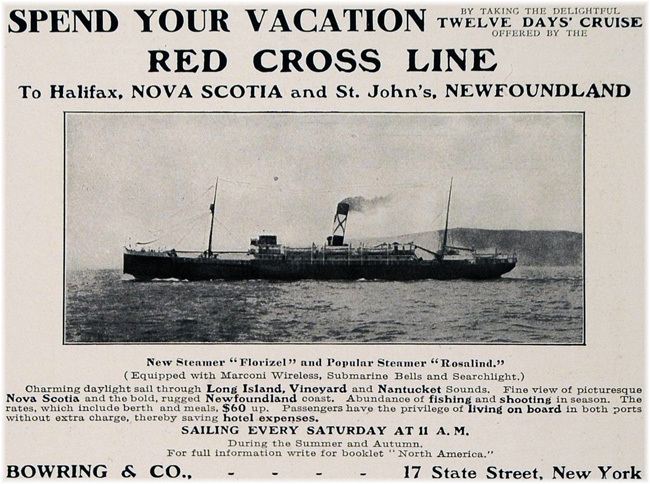 One of the more interesting itineraries will be round trip from New York on April 15, a 15-night voyage calling at Newport, Boston, three ports in Maine, Halifax, St John’s NF, St Pierre, Louisbourg, Portland and New York. This voyage can also be booked as a 7-night voyage from New York to Halifax or as an 8-night voyage from Halifax to New York on April 22. On April 30, the Fram will depart New York on a 10-night cruise to Yarmouth, Charlottetown PEI, Bonaventure Island, Percé and Havre St Pierre in Quebec, Bonne Bay NF, the Magdalen Islands and Halifax. The Fram, which was built in 2007 at Fincantieri, will offer six such Atlantic Canada and New England cruises before returning to her usual Iceland, Greenland and Northern Europe itineraries for the summer. She will then return to Halifax in October after her usual expedition voyages to northern waters. On October 8, she will offer a 12-night cruise from Halifax to Miami with calls in five New England ports including Boston, an overnight in New York City and a call in Charleston before arriving at Miami. Based on full ship charters that it has operated in the Australian market for several years now, Cruiseco has been active in the UK market since 2016 in offering full charter music cruises. Beginning with a 3-night Rock the Boat cruise on board the 2,852-berth Celebrity Eclipse from Southampton in September 2016, to be followed with a 7-night Rock the Boat cruise on CMV’s 1,450-berth Magellan from Newcastle in September 2017, Cruiseco has scheduled two more 7-day cruises for 2018. January this year saw the official announcement of Bravo! A Cruise of the Performing Arts on the 2,886-berth Celebrity Silhouette, departing Southampton on May 19, 2018, for 7 nights to Bilbao, Vigo and Cherbourg, starting at £1,890 per person. 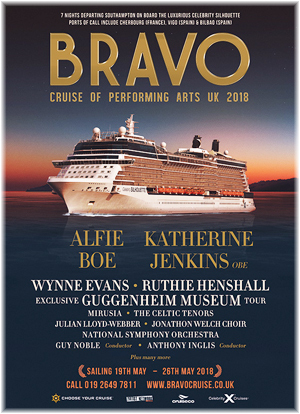 Performers on this cruise with include Katherine Jenkins, Alfie Boe, Wynne Evans, Ruthie Henshall, Mirusia, The Celtic Tenors, Julian Lloyd Webber, The Jonathon Welch Choir, The National Symphony Orchestra, conducted by Guy Noble and Anthony Inglis. Plus more than fifteen other stars who will perform around the ship morning, afternoon and evening. Then in June, Cruiseco announced another 7-night music cruise, Back to the 80s 2018, on board Royal Caribbean International’s 3,286-berth Navigator of the Seas, departing Southampton on May 6, 2018 for Bilbao, Vigo and Lisbon, from £1,550 per person. Entertainers include Tony Hadley (formerly of Spandau Ballet), ABC, Sara Cox (presenter of ‘Just Can’t Get Enough 80s’) Kim Wilde, Belinda Carlisle, Go West, Paul Young, The Babys, Cutting Crew and T’Pau plus others. Last week, following Cruiseco’s lead, a company called Floating Festivals announced two more music cruises for the Navigator of the Seas, with a 3-night 80s Festival At Sea departing Southampton on October 12, 2018, and a 4-night Musical Theatre Festival at Sea sailing on October 15. Royal Caribbean and Celebrity will thus be benefitting from four music charters in 2018, with Celebrity Silhouette employed for seven nights and Navigator of the Seas for fourteen, for twenty-one nights musical employment.